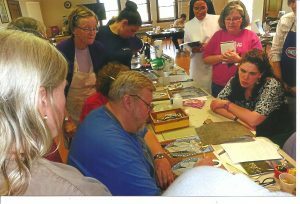 As the popularity of icon painting in the United States and Canada has grown, the number of Phil’s classes has also grown. His icon painting workshops have taken him all over the US and Canada, and his work has cultivated a significant following of artists and church iconographers from all religious and cultural backgrounds who find the art of iconography spiritually meaningful in our troubled times. Since opening his first studio, Phil has taught more than 2000 students, some of whom have, themselves, become noted iconographers. Noted American iconographer, Phil Zimmerman, was born on September 17, 1953 in Stoystown, Pennsylvania in the southwestern county of Somerset. This region has historically been home to a large concentration of Eastern European immigrants of the Orthodox and Eastern Rite Catholic faiths who arrived in America in the 19th century and worked in the local coal mines and steel mills. It was through his proximity to this culture that Phil first developed his life-long interest in iconography. While an Art student at Indiana University of Pennsylvania, Phil studied iconography with Richard Osacky, (the late Bishop Job, OCA Diocese of Chicago and the Midwest), who was then attending seminary and serving at St. John the Baptist Church in Black Lick, Pennsylvania. Icons produced in Phil’s studio are painted in accordance with ancient guidelines and techniques, incorporating modern artist’s materials. Boards are carefully prepared with cloth and gesso ground, painted in gouache, and embellished with 24-carat gold leaf in the preferred Byzantine style. Selected subjects are chosen by careful study of time-honored prototypes. Individual commissions are similarly executed. The excitement Phil finds in iconography is in the way it combines artistic skill and creativity with spiritual motivation, discipline, and religious devotion. In this, he believes it is above all other forms of painting. Phil is happily married and has 3 children.